Continuing the pattern of last year, I’m making a good run through the Newbery winners. 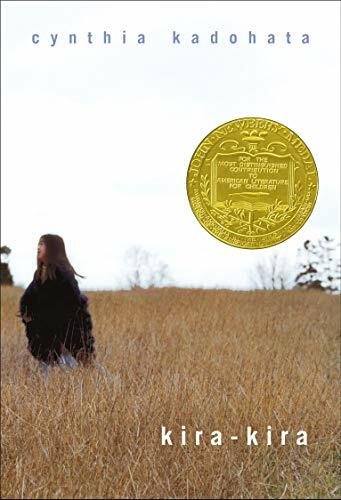 I picked Kira-Kira by Cynthia Kadohata in part because it also serves my diversity challenge, centering on a Japanese-American family living in Georgia in the 1950s. There was some exploration of that dynamic…but it was also the most unrelentingly depressing Newbery I’ve read yet! The narrator is Katie Takeshima, but the story really centers around her beloved older sister Lynn. Lynn is brilliant, loving, a force in the family and full of dreams for her future. You can already see where this is going, can’t you? Lynn is one of those too good to live characters, and sure enough—as the book goes on Lynn is vaguely and sporadically ill…then less sporadically…then fatally. I don’t like stories about children dying. I’m just going to put that out there, and admit that this makes it harder for me to judge if this was a good story about a child (well, teenager) dying. I especially hate stories about children dying in slow, lingering ways, which this definitely was. I love The Bridge to Terabithia, but that’s not a book about death—it’s a book that contains a death. Kira-Kira is largely focused on Lynn’s slow decline and death, and how Katie handles it. I actually like books about grief better—but the bulk of this book is leading up to Lynn’s death, not the aftermath. (Although the aftermath does manage to give us a hopeful ending.) That’s never going to be my kind of story. It probably says something, actually, that this is the most depressing Newbery I’ve encountered yet. Newbery has a reputation for picking books with a lot of death in them. Based on my reading so far (58 of 95) I haven’t noticed that as a major theme…but it was definitely true this time! The book does sound quite sad. Does it explain why the family lives in a Southern town in the 1950’s with so few other Japanese? Just wondering what the back story for that was, if there was one.